Vanilla cake with vanilla buttercream! 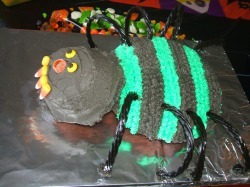 Stripes done in chocolate buttercream! Decadent chocolate cupcakes with creamy buttercream. Chocolate cake, with vanilla buttercream. 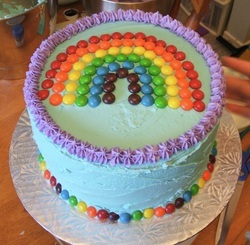 All decorating in buttercream. Chocolate cake with vanilla buttercream. 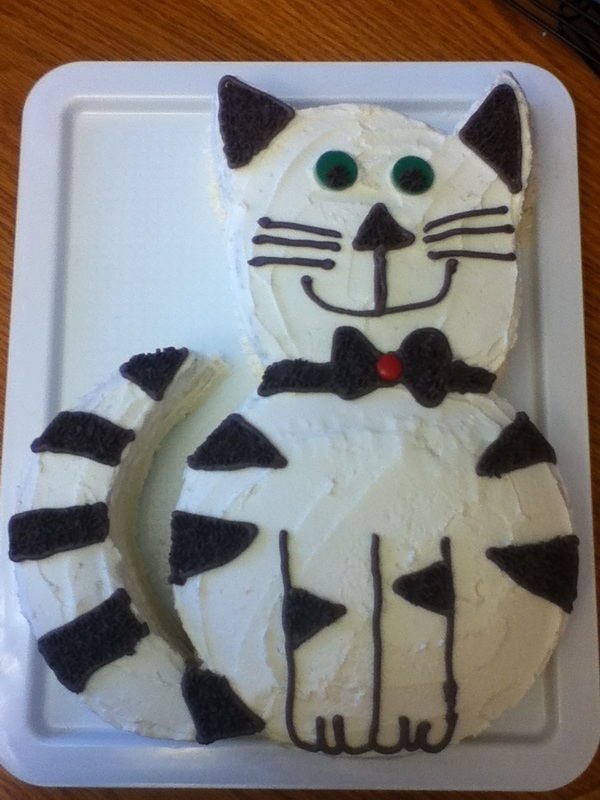 Black is done with fondant, all other decoration is buttercream. White cake with vanilla buttercream. 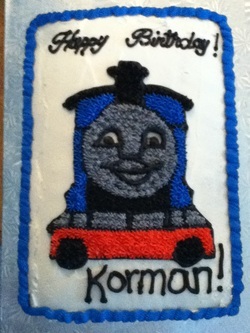 Thomas the train and writing done in buttercream. 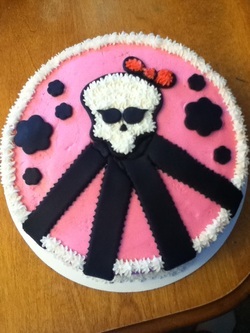 Cake was white cake dyed pink and covered in fluffy pink vanilla buttercream. 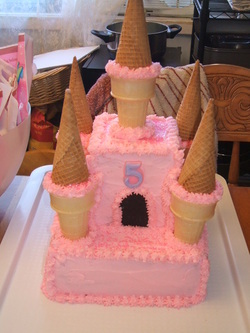 Number "5" made of fondant, and towers are made of regular and waffle cones. Chocolate cake with vanilla buttercream. 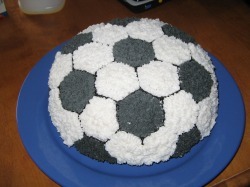 Soccer ball pattern done in buttercream. Cupcakes are vegan chocolate with vanilla buttercream. Flowers are made on fondant and accented with a skittle! Three dozen cupcakes were done like this. 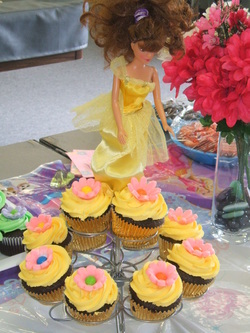 One dozen was done in gold cups with gold frosting to match Princess Belle's dress (see below). 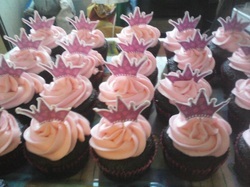 With gold wrappers, gold frosting, and pretty pink flowers, these cupcakes were designed to represent Belle's dress. 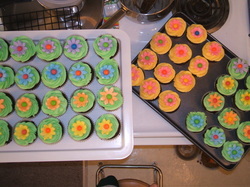 These cupcakes are also vegan chocolate decorated with vanilla buttercream and fondant flowers with Skittle centers. Chocolate cake with vanilla buttercream. Decorated in swirls and dots for a first birthday party. 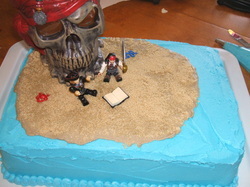 Pirate cake! Skull and characters are Lego (TM). Cake is mint chocolate with vanilla buttercream. Island is brown colored icing with brown sugar "sand". 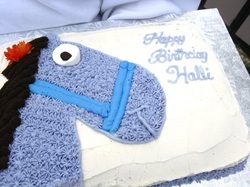 Horse themed cake for a ranch/pony ride birthday party. Chocolate cake with vanilla buttercream. Chocolate buttercream was used for mane with artificial flower for decoration. 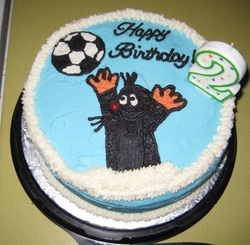 Mole cake. "Mole" is a character from a children's book in the Czech Republic. 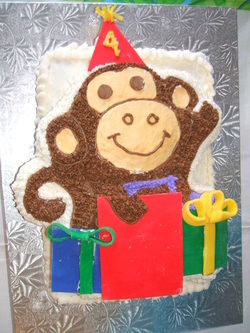 Cake is chocolate banana with vanilla buttercream. This cake is completely dairy free due to an allergy. 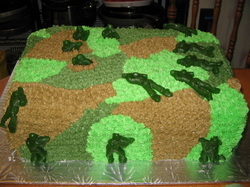 It is a white cake with vanilla buttercream, covered in a tri color camoflage. The army men are green apple flavored gummies. Vegan chocolate with vanilla buttercream. 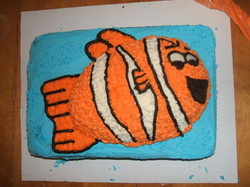 Nemo's profile was done with half a 3-D egg. Cake was iced blue and sprinkled with blue colored sugar to look like water. 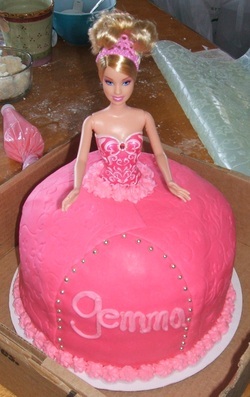 White cake with vanilla buttercream covered in pink modelling chocolate. Embellishing done with light pink buttercream and silver non pareils. Modelling chocolate was patterened with vine mat to match bodice. Chocolate cake with green buttercream. Head was printed, laminated and added before presentation. White cake with white buttercream. Bottom tier is covered in modelling chocolate and embellished with homemade fondant polka dots and flowers. Top tier is white buttercream with modelling chocolate stripes and bow is made of fondant with modelling chocolate polka dots. 6 layers of white cake dyed red, orange, yellow, green, blue and purple. Covered in sky blue colored vanilla buttercream. Rainbow and bottom border made out of Skittles. Chocolate cake covered in dark blue vanilla buttercream. 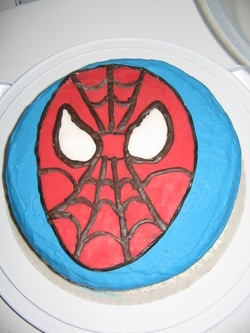 "Spidey's" face is built out of modelling chocolate and fondant (eye whites). Black forest cake made for my oldest daughter's 8th birthday the day before Halloween. 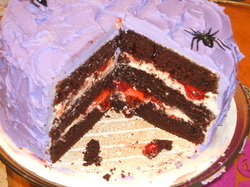 Fluffy purple icing covered in plastic spiders. Chocolate cake layers with buttercream instead of whipped cream. 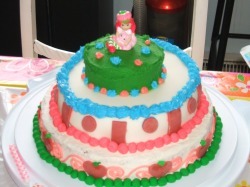 This was a vegan chocolate cake done for my youngest daughter's fourth birthday. It was based on her Build-a-Bear monkey who has a purple ball gown own with a purple necklace. 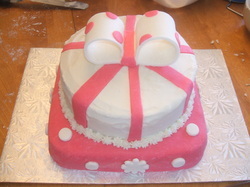 The cake is covered in chocolate buttercream and the hat, presents and bows are fondant. 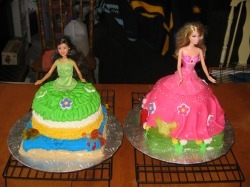 Two Barbie cakes, the one on the left is a vegan chocolate and the one on the right is a vanilla cake. Both were iced with buttercream and the pink one was covered in modelling chocolate. White cake with strawberries. 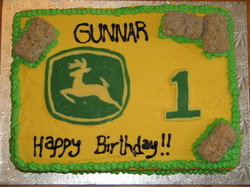 Iced with yellow buttercream, John Deere symbol made out of modelling chocolate, hay bales made out of Rice Krispie treats covered in Mini Wheats. 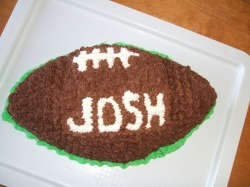 Dairy free football cake, white sponge cake done with vegan chocolate and white buttercreams. 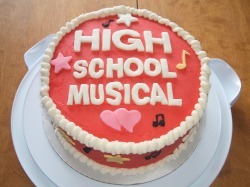 High School Musical cake for a 9 year old girl's costume party. 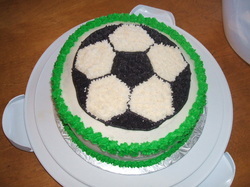 This cake constituted a few firsts for me. 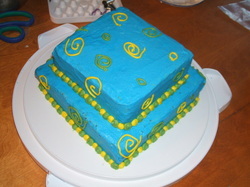 It was my first cake that was more than two layers high, and it was my first time using gum paste. This was my first foray into frozen buttercream transfers, an Indian Jones cake for my nephew, who now starts telling me what he wants for next year AT the birthday party! 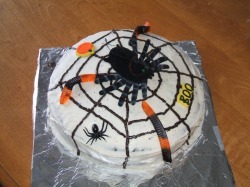 This spider was done for my oldest daughter's 6th birthday. Her birthday is the 30th of October and so each year I get to come up with a new and creepy cake for her. This cake was special. A friend whose son has an egg and dairy allergy was commenting on how hard it was to make a cake taste and look good. I volunteered to see what I could come up with. This is a completely vegan chocolate cake with a homemade vegan buttercream. 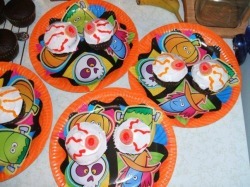 Eye-ball cupcakes for my oldest daughter's 5th birthday. Everybody got a "set" of eye-balls to eat instead of a piece of cake. 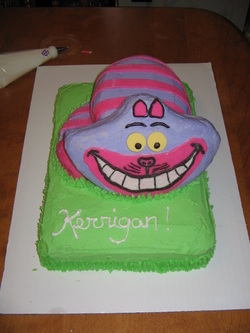 This was my youngest daughter's first birthday cake and turned out so much better than I could have imagined! 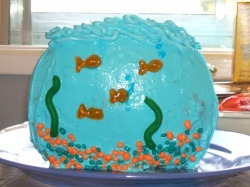 The rocks are done with nerds and the fish and "sea weed" were done with piping gel. 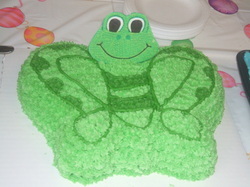 This was my first elaborate cake. 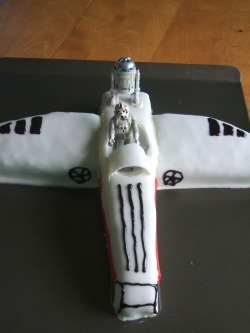 My nephew asked for an X-Wing fighter and I had heard that you could do amazing stuff with fondant, so I went out and bought some. (I now make my own.) 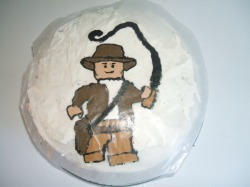 Him and his friends were floored when I brought this cake in. 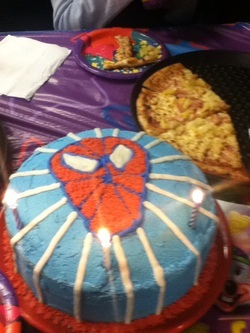 This was my oldest daughter's 7th birthday cake. It was covered in spiders and worms with a giant hairy spider sitting on top. My daughter and her friends really got a kick out of it.